In an effort to “detox” my body this week for the holiday eating I indulged in, I’m making an effort to eat mostly low carb/high protein, and as little processed food as possible. One dish that will be on my menu is this Chicken and Garbanzo Bean Pesto Salad Recipe. Not only is it super easy to make, but it’s a great way to utilize leftover chicken or rotisserie chicken, and with all the protein and fiber, it’s a pretty satisfying salad. The basil pesto dressing adds a lovely and bold flavor without needing to use too much of it, which is great for helping to keep the Points low. 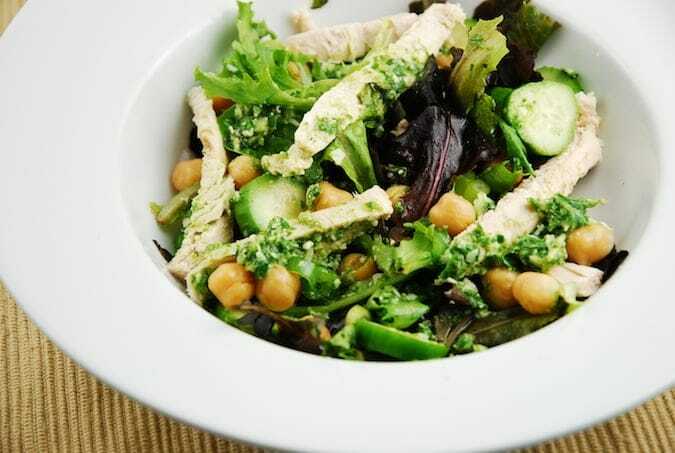 Pair this Chicken and Garbanzo Bean Pesto Salad with your favorite low calorie soup or a roll or baked potato to make it a complete and very filling meal. Enjoy! Zesty yet light, the chicken and garbanzo beans make this easy salad recipe filling enough to serve as a main course. It’s a great dish to use up any leftover chicken, and it’s as healthy as it is delicious. Make pesto sauce by adding the basil leaves, garlic, parmesan cheese, olive oil, water, and salt & pepper to a food processor and pulse to combine. In a large bowl, combine lettuce, cucumbers, garbanzo beans, chicken and green onions. drizzle in the basil pesto dressing, and toss to coat. Divide evenly into 4 bowls, squeeze lemon juice over each one, season with addition salt and pepper, and serve.